Looking back on my days as a novice investor, I can remember listening to much more experienced investors brag and/or complain endlessly. I would sit (or stand) quietly and collect bits of their valuable knowledge, insight and experience. Some of those tips I learned years ago have proven to be timeless. They are just as applicable in today's challenging markets, as they were many years ago. I would like to take a moment to share some of those insights with you. Do your research: Only you know the types of investments that are right for you and your risk factors and personal preferences. 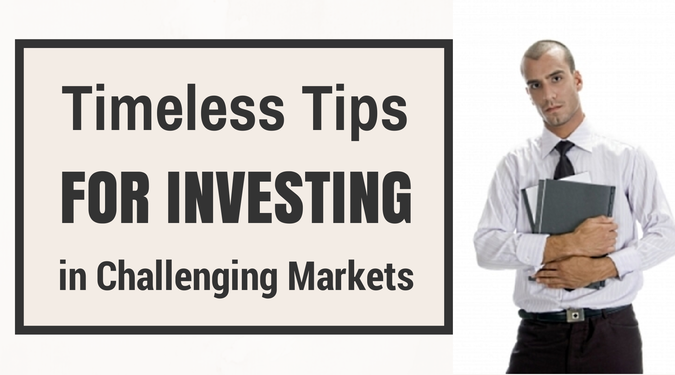 It is therefore important to do your own research when considering investment types. No one, not even a broker or a financial analyst, can tell you how you feel about certain things. Therefore, doing your own research really helps you understand what you are comfortable with. Stay on top of your investments: If you choose to work with a broker or asset manager, the odds are you will receive periodical updates on the performance of your investments. This is good. It is important to constantly be aware of where your money is, and how it is performing. If you are managing your own investments, it is even more important to track these things, as you are completely responsible for your own financial success. Stay on top of your industry: Your investments most likely fall into one main industry (manufacturing, shipping, real estate, etc.) and therefore it is important that you understand your investment and where that specific industry is going. Stay aware of what major causes and effects are taking place. Get insight anywhere you can: Every investor worth a grain of salt is always looking for any insight he/she can get. It is part of the process of staying on top of your investments. Reading, researching, and getting the opinion of other investors, are all great ways to gain insight. Work with an international broker if investing outside of your country: Each country and market comes with its own set of rules and regulations. If you are considering investing into emerging markets or a different country all together, it would be a wise decision to find a broker that is in that country and is comfortable with the region's rules and regulations. Have a spread out portfolio: Do not invest everything in one specific investment. Spreading out your portfolio allows you to lower your overall risk and should increase your long-term return potential (generally speaking). Consider introducing alternative investment strategies if you are heavy in stock, bonds, and/or real estate. Much of what the tips above speak to is the collecting and analyzing information. In today's world, performing in-depth research is not nearly as difficult as it was a decade ago. Also, take advantage of all of the latest innovations to communicate with the people who are helping you invest and maintain your portfolio.